Make a difference. Teach and inspire. Do more. 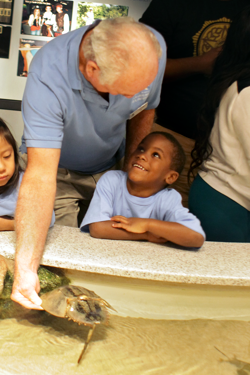 These are only a few of the reasons people volunteer at the Aquarium. Sharing your time and enthusiasm for marine life can impact someone's day and benefit all our tomorrows. Volunteers must be 18 years old and commit to a minimum of eight hours per month. After submitting a Volunteer Application Form, accepted volunteers will attend orientation, understand our mission and message, meet staff and learn more about volunteer opportunities. A required $25 fee, which covers uniforms and training, is due during volunteer orientation. Education: Interact with visitors as exhibit interpreters and educators. Horticulture: Assist with plant care and maintenance inside and outside the Aquarium. Aquariology: Work alongside Aquarium staff to maintain freshwater and saltwater exhibits. Operations: Keep Aquarium grounds safe and clean by assisting with repair and maintenance. Special Events: Assist with organization, set-up and break down of after-hour events. Special Activities: Teach visitors during camps, programs and classroom activities. Dive: Assist with cleaning and maintenance inside Aquarium exhibits. Must be SCUBA certified.